Stainless steel case with a black alligator leather strap. Fixed stainless steel bezel. Silver dial with blue-toned hands. Minute markers around the outer rim. Dial Type: Analog. Date display at the 3 o'clock position. Chronograph - two sub-dials displaying: 60 second and 60 minute. Automatic movement with a 72 hour power reserve. Scratch resistant sapphire crystal. Case diameter: 43 mm. Round case shape. Folding clasp. Water resistant at 30 meters / 100 feet. Functions: chronograph, date, hour, minute, second. Additional Info: rotating discs serve as indicators for chronograph function.. Luxury watch style. Watch label: Swiss Made. 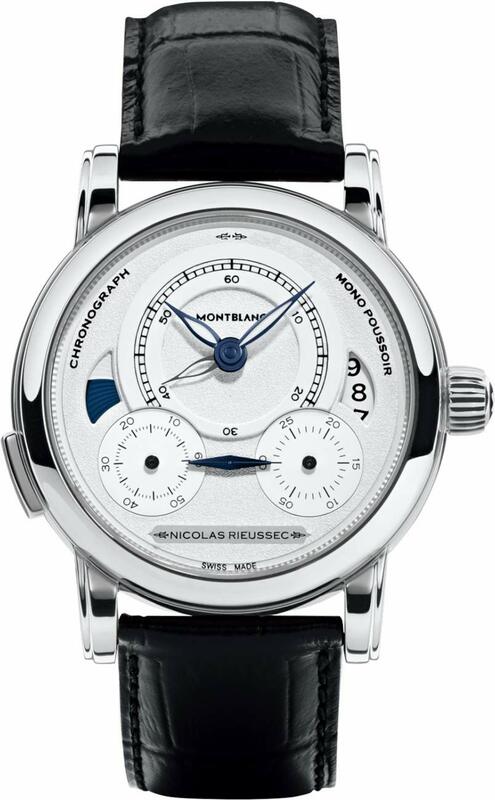 Montblanc Homage To Nicolas Rieussec Mens Watch 111012.